The barn at Cove Ridge Marina located on Piercetown Road in Butler, Tennessee was built in the late 1800s by Henry White. Mr. White built the barn from hand-cut timbers for his son-in-law, John Pierce. 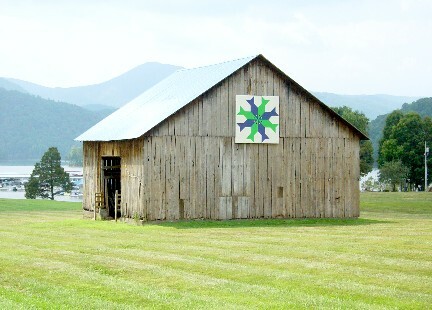 John Pierce owned and farmed the land where Cove Ridge Marina is today.The Bass and Trout quilt pattern was selected due to the obvious connection between the pattern and the current marina aspect of the land on which the barn resides. The quilt artist for the project was Candace St Lawrence from Johnson County, Tennessee. The Hart Farm was purchased in 1838 from Joseph Garland, Jr. In 1841, Harrison Hendrix purchased it from his parents, Solomon and Susanna Hart Hendrix (Solomon's great-uncle was the purchaser of the land in 1838). In 1860, Harrison Hendrix sold the property. Harrison Hendrix was one of four persons entrusted with the plans to burn railroad bridges during the Civil War. Two of his wives are buried on the property. In 1860, Harrison Hendrix sold the property to George Persinger, who died in 1887 and left the property to his son, George Lewis Persinger. In 1868, George Persinger donated the land for the Brick Church (now known as the Brick Christian Church). George Lewis Persinger died in 1893 and left the farm to his six children, one of which was Julia Pearl Persinger Hart, the grandmother mother of the current owner.